Creating our first module (now that the interpreter and the project are already configured). 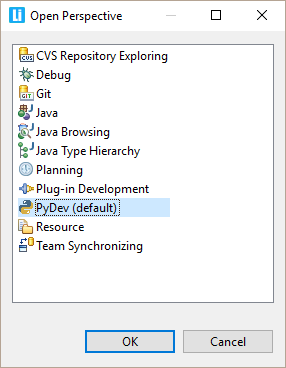 To make things easier, make sure that you are in the PyDev perspective – it is automatically opened when you create a PyDev project, but just in case, you can open it by going to the menu: Window > Perspective > Open Perspective > Other ... > PyDev, as pointed in the picture below. First, we will start creating a new package in a project named 'test' (it was created with the default 'src' folder, and all the code should be put underneath it). 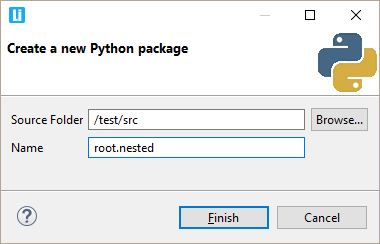 So, let the 'src' folder selected and go to the menu: File > New > PyDev package (or Alt+Shift+N, A) and fill the package name as below (the source folder should be automatically filled).. 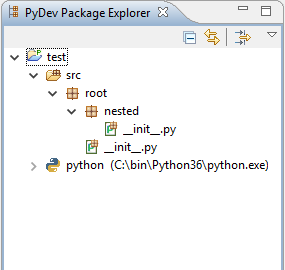 If everything goes ok, the structure below will be created (and the file /root/nested/__init__.py will be opened). Now, let's create the example module. 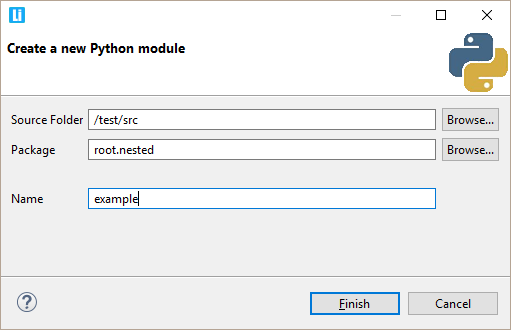 Select the folder /root/nested and go to the menu: File > New > PyDev module (or Alt+Shift+N, M) and fill the module name as below (again, the other fields should be automatically filled). 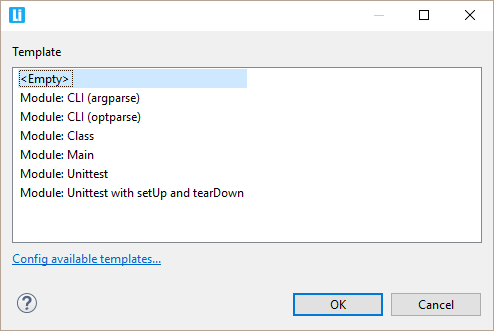 After you press Finish, a new dialog with which module template should be used to create the module will be shown (and the Config available templates... link in the dialog can take you to the place where you can add/remove/edit those - which are the templates under the New Module context. 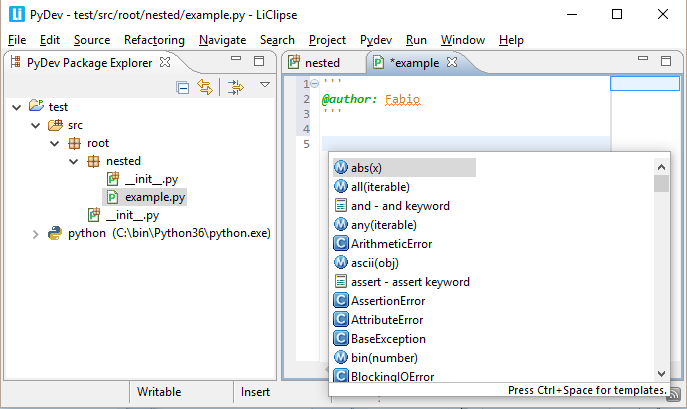 The file /root/nested/example.py should have been created, so, to finish this example, in the empty file, press Ctrl+Space (that's the shortcut for the PyDev code-completion). Once you do that, the 'context-sensitive' completions should appear (as below). NOTE: If the code-completion does not work, see the FAQ on the topic. NOTE FOR JYTHON USERS: If you are in jython, the first activation might take a while. This usually happens when jython has to do the processing of new jars. The next time you start it, if it takes the same time, it could be that your jython 'cache-dir' is not writable, so, you can create a script with the code below to see where is the cache dir and check its permissions (or if there is no permission problem, you can try deleting the dir and seeing if it gets correctly recreated in the next jython activation).